Description: Clear the tracks for the Chuggy Pop-Up engine! When pulled, the engine rolls along with a merry "chug-chug-chug" sound while the little engineer pops his head up and down. FPT8308 - Red wooden train engine with a round fiber cylinder boiler on the front and a square wooden engine cab on the back. The boiler has a black paper lithographs wrapped around the sides with pictures of steam and steam engine parts. The boiler has a round metal front and a blue wooden smoke stack on the top. The cab has a paper lithograph on the sides of a window with an engineer in the window holding a lantern in one hand. The window seal has "CHUGGY POP-UP" written in white. 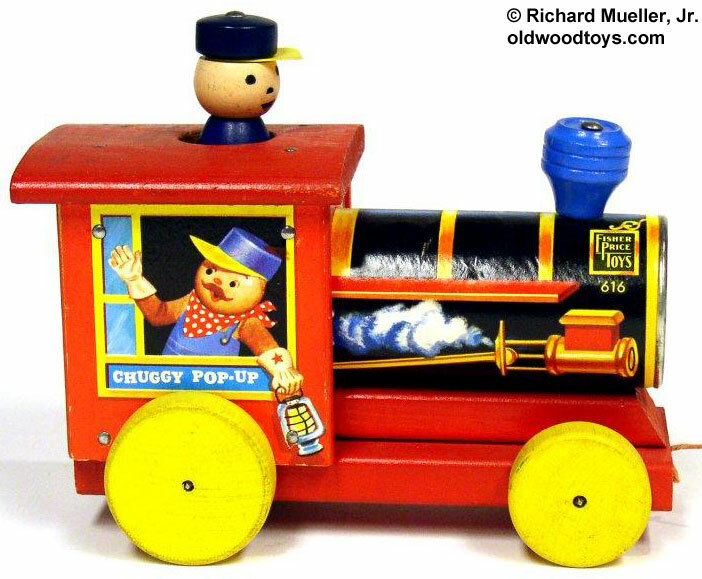 The top of the cab has a small hole with a round wooden engineer head that pops up and down when the toy is pulled. The engineer has a round blue wooden cap with s yellow plastic bill. 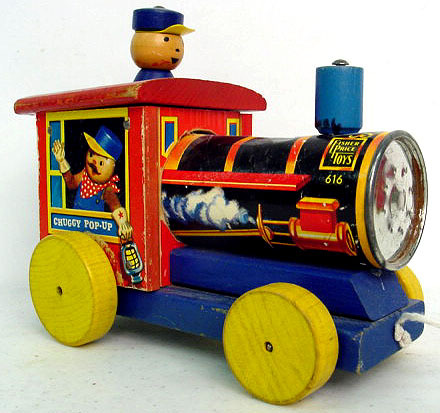 This toy rolls on 4 yellow wooden wheels, makes a "chug-chug" sound, and the engineer's head pops up and down as the toy is pulled. Measures 7" long, 5-3/4" high, 3-3/4" wide.